Animedia magazine publishes monthly chapters of the novel Kamigami-tachi no Gosui written by Atsuko Asano and illustrated in collaboration by various artists. 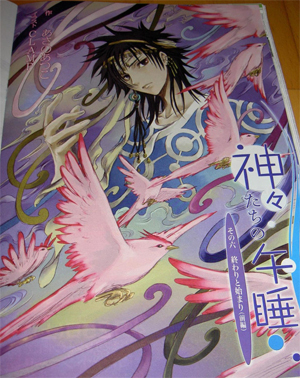 CLAMP was chosen to draw the illustrations for the two final chapters and kitsune_no_ame was nice enough to share cam shots of the 4 illustrations that CLAMP drew for the first of them. So gorgeous, isn’t it? I can’t wait for next month’s illustrations. Update: cutesherry has super HQ scans of the full Kamigami-tachi no Gosui chapter and also CLAMP’s Cover Gallery from this month’s Newtype. Looking at them, I can’t help but think that Gate 7 will look very much the same. At least, I hope so! Also, thanks to both you and kitsume_no_ame for sharing these with us. Oh but pleeease! That’s great! It would be great if you could preview Newtype too! Sure, I’ll take pics of the Clamp-related stuff (other than the Kobato. chapter). :OOOO TOO Pretty!!! Damn why is it so pretty??? ;_; Thanks for the photos. These are beautiful. Thanks to you and for sharing! I think that it looks like the preview picture for Gate 7, I guess they’re practicing a different style now to make the transition easier later (god, when you think of all the different styles they have drawn in… it’s pretty amazing). In the new released german TRC manga no.22…Fay says in the scene between him and Kurogane the whole name “Kurogane”. But in the original manga…Fay says “Kuro-sama”..or not???? That’s because years ago EMA (German publisher of TRC) decided to drop the honorifics (and used variations like “Mr Blackman” etc). At first it were just silly honorifics, I guess they didn’t understand the importance of it now. No, I want to know, if there is in the original japanese scanlation “Kuro-sama” or if it´s a full “Kurogane”. Bzw. Ich will wissen, ob das wirklich im Original Japanischen dastand. Hab mich schon im Comicfoum beschwert. Ich find das so schrecklich, die ganze wichtige Pointe geht verloren. in page 22 of my Deluxe Japanese edition, volume 22. The second image reminds me of the artwork in Shirahime-Syo. So beautiful. >>So gorgeous, isn’t it? I can’t wait for next month’s illustrations. Those illustrations are beautiful. That boy reminds me of Touya. I’m actually most impressed with the frog illustration – I’ve never seen CLAMP draw with that style before. And I got also surprised with the frog! how beautiful!! I would like to have a poster with this picture. Thanks for scanning, kitsune_no_ame and for sharing Chibiyuuto! ^_^ Is Cutesherry’s version already released? >Is Cutesherry’s version already released? >They feel like Oshiroi ChouChou! I think so too. Loved the flying fishes. this is not from month’s Newtype.